Local electricity for local people? What is local supply all about? Is it a good idea? Should we be pushing for this model in the energy system, or is centralised public ownership a better option? What about peer to peer trading, and private wire arrangements? These are some of the questions that came up in the session on local supply at the Community Energy: The Next Generation event in Plymouth. Local supply of energy is much desired in the community energy sector, but not currently permitted. It is about selling energy, particularly electricity, to people local to where it is generated. At the moment, electricity must be sold through a national licensed supplier, a role which is too onerous and too costly for community groups to take on. It’s important to distinguish between what happens physically in the electricity system, and what happens in accounting terms. Physically, electricity generated locally flows ‘downhill’ to the nearest energy demand before it goes further away in the network. Local supply is about changing the accounting arrangements rather than the physics. Selling electricity locally without a supply license is possible in a very limited number of ‘license exempt’ situations, but this is not what is meant by local supply. License exempt situations include private wire arrangements – i.e. installing a new cable, privately owned, that directly connects the generation to the consumer. This can be connecting a solar farm to a nearby industrial estate, or sharing electricity within a new co-housing development. In contrast, local supply is about transporting electricity across the public network, owned by the low voltage grid Distribution Network Operator (DNO). This is currently not usually allowed, but some experimental sites have permission to carry out trials. For example, Energy Local in Bethesda is using the public network butproviding a local energy tariff with licensed supplier Co-op Energy. Co-op Energy offer a cheaper time of use tariff to people in the village of Bethesda that reflects the production of the local hydropower. Smart Fintry in Scotland is working with Good Energy to do something similar, and Repowering London are involved in a peer to peer pilot using blockchain facilitating the sale and purchase of solar PV electricity on an estate in London outside of standard regulatory conditions. Why do we want local supply? There are a number of reasons. One is that community energy groups are finding it difficult to develop viable business models for renewable energygeneration in a post-subsidy context, and see direct sale of electricity to consumers, bypassing intermediary costs, as a way of securing enough income to make projects viable. This is attractive, but in practice those involved are still relying on the existence of the grid to fill in the times when the local generation and local consumption don’t fit. If some communities were to avoid paying the costs of the wider system, it would ultimately fall apart, and we would all lose out. We need to continue investing in ‘grid solidarity’ – i.e. making a contribution to the shared system cost. This means local supply of energy may not be cheaper or may even be more expensive overall than traditional ‘national supply’. A second reason for local supply is to enable local balancing. This means that decentralised generation, storage and demand response are deployed locally to use locally generated electricity nearby as much as possible, and minimise flows into and out of the local network. This can contribute to making best use of existing infrastructure and reducing the need for new assets, and make a positive contribution to national balancing. The transition from DNO to DSO (Distribution System Operator) is already part of a decentralisation and localisation of responsibility for keeping the grid in balance, which has historically been a purely national responsibility. Local supply, combined with local energy markets and balancing at local grid supply points can all enable decentralised and community contributions to local balancing. A third reason for local supply is to make local energy generation more meaningful and attractive to communities. There is a strong need to develop meaningful public consent for the energy transition, and this consent is more likely when people can directly benefit from the energy generated. Local supply can make community ownership of generation tangible, and allow energy co-operatives to provide substantive member benefits of access to electricity they generate, rather than only financial return on investment. This is what is needed to refute the FCA decision that renewable energy investment co-operatives can’t be ‘bona fide co-operatives’, but must be community benefit societies, as the current system does not allow sufficient non-financial direct benefit to members. 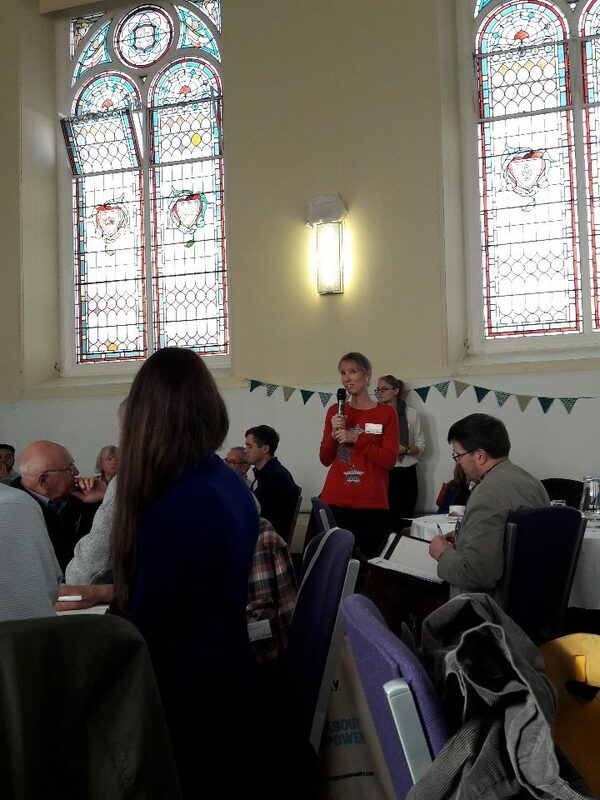 CSE have shown that when we start a conversation based on what people value about their local area, and an open question about how to respond locally to the energy transition we need to make, support for community owned wind generation increases during the course of the discussion. Community ownership is an important part of this, and local supply would make the local economic benefit even more tangible. A small town of 20,000 people spends £25 million a year on their energy bills. Local supply would enable some of that spend to be kept in the local economy, rather than leaking out. Supporting local economies is not about being uninterested in the bigger picture. It’s about keeping money circulating among ordinary people and places. There are some strong reasons for local supply, even when the idea of avoiding grid costs is discounted. It can help with local balancing and integrating modern decentralised electricity technologies into the grid, ensuring that governance of the system evolves along with the infrastructure. Local supply can also be part of making decentralised generation attractive and tangible, and keeping energy spend in the local economy. However, as public ownership of public services moves up the political agenda, with nationalisation of the energy system included in the Labour Party manifesto, and growing support for the We Own It campaign, we need to rethink the benefits of local supply in this context. Would renationalisation of the energy system solve the problems that local supply is trying to address, by creating an efficient, low carbon energy system that is affordable for everyone’s basic needs? Or is there still a role for local supply? The most attractive option may be a mixture of local and national energy provision. There is a risk that focusing on decentralised local supply may lead to national inequalities in price and access to energy. There is therefore a need for a national redistributive force. Nationalisation of transmission and distribution networks could achieve local balancing through non-market means, by using efficient technocratic decisions. On the other hand, the most compelling reason for local supply, of making energy tangible and creating greater public consent for the energy transition, would not be achieved by nationalisation. With decentralised generation technologies, smart energy control systems and a strong community energy sector, there’s an exciting opportunity to redesign public ownership so that it provides real agency and responsibility for local people rather than just central control and passive dependence on state provision. How this works in practice is being explored by many people, and the discussion about local energy markets and local supply is all part of making this debate grounded in real, practical projects. Watch this space, these are exciting times! Thanks to Jodie Giles from Regen for her contribution to this blog. Putting people at the heart of the energy system? What does People Powered Retrofit look like?